The crack of the bat sounds quite familiar to any baseball fan. Ninety feet between bases, nine players on a side, three outs and you’re done—these characteristics certainly ring true to anyone familiar with America’s national pastime. However, the first time you witnesses the game known as vintage base ball (it was two words back then), some things jump out immediately as unusual. The attire is far different from modern-day uniforms, no one is wearing gloves; the pitcher most likely is delivering the ball underhand; players very well could be recording outs on balls that bounce before being caught. This sport—which typically reenacts game play from a range of years between 1858 and 1886—has existed for roughly 30 years and has become something approaching an obsession for many of the players on the approximately 400 teams around the country. It harkens back to the beginnings of the game as we know it, appealing to those who want to learn the history of baseball and crave a simpler time when players weren’t millionaires (they often weren’t paid at all), owners weren’t billionaires, and stadiums didn’t have massive high-definition screens, thumping music, and t-shirt cannons. The first clear difference a viewer of a vintage game will observe is in the uniforms. Players are dressed to replicate as well as possible the look of teams from roughly 150 years ago. Inspiration frequently comes from actual teams that existed at the time, from nationally known squads to local nines. Members of the Cincinnati Buckeyes. 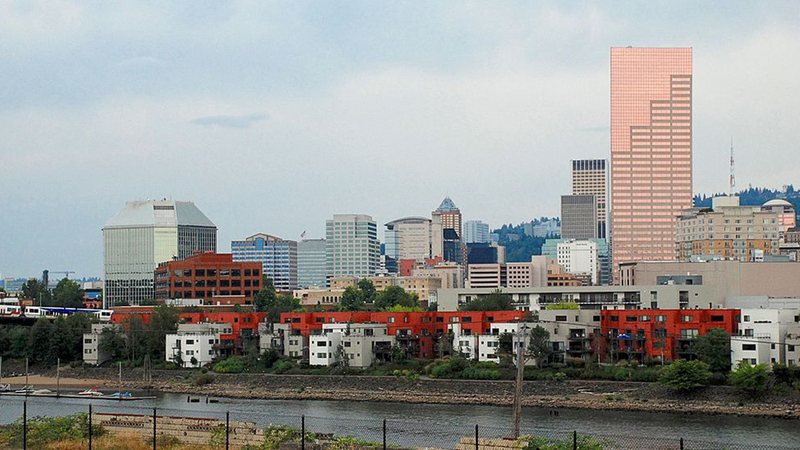 Photo credit Traci Essen. The shield on the chest of many uniforms is taken from firemen’s uniforms of the time, and some teams sport the knickers that were common in that era. Others choose a basic look of simple shirts and long pants, reflective not only of the variety of team attire back then but also of the fact that some teams couldn’t afford dedicated uniforms, with players simply sporting the clothes they might wear in the field during the work day. As the game begins, several obvious—and some not-so-obvious—deviations from modern baseball stand out. First, the pitcher delivers the ball underhanded, with speeds varying from lackadaisical to swift depending on the team and pitcher. Overhand delivery was not allowed until 1884, so unless you’re watching a game based on that year or later, pitches are more akin to modern softball (somewhere between slow-pitch and fast-pitch) than today’s hardball. You’ll also notice there isn’t an umpire crouched down behind the catcher, calling balls and strikes. Nor are there umps at each of the bases. In the 1860s, there was a single umpire—typically wearing a suit and hat—and he largely served the role of tie-breaker if the two squads could not agree between themselves regarding a particular cal—-a bang-bang play at first, for example. Among his duties, the umpire will issue a warning to a pitcher who refuses to deliver good pitches—or a batter who refuses to swing at the same—and then will call balls or strikes as required. He will not, however, consider foul balls as strikes, per the rules of the time. If neither team is able to provide an umpire, players will rotate to fill the responsibilities of that role. Another surprise is to see a batter called out if a fielder catches the ball after it hits the ground. Through the 1864 season, any ball caught on one bounce was an out. Starting in 1865, fair balls had to be caught on the fly to record an out, though foul balls caught on a bounce still were outs until 1884. Struck balls are deemed fair or foul based on where they first hit the ground, so a ground ball pulled down the line that lands in fair territory 30 feet from home plate before veering outside the base path into foul territory prior to reaching the base is a fair ball. And the batter who hit such a ball needs to hustle to first base and then stop quickly, because overrunning first base was not allowed as it is today. There are a variety of other rules that changed as the game evolved—such as defensive positioning, somewhat akin to the recent trend of increased shifting. Each team has its own home rules depending on field geography and local preference, which need to be understood and agreed upon in advance. One of the reasons for differing home rules is the variety of locations of the ball fields used for base ball. Most vintage games are not played on pristine diamonds with perfectly manicured grass. Teams typically set the bases at their prescribed locations and distances in an open field, where lumpy infields, hills, trees, and other quirky characteristics can alter the path of a ball or a fielder from time to time. Is that branch in fair or foul territory? Is a ball over the train tracks an automatic single, double, triple, or home run? Or is it a live ball, with the runner advancing at his own risk? Is an overthrow into the nearby parking lot a dead ball, and if so, how many bases do runners advance? These are the sorts of circumstances teams need to consider and resolve beforehand. 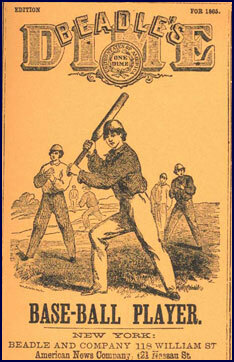 Until the 1870s, players played barehanded. Eventually, catchers and first basemen, who caught the most balls, became the first players to use gloves–crude, fingerless working gloves initially–to provide some relief for their battered hands. 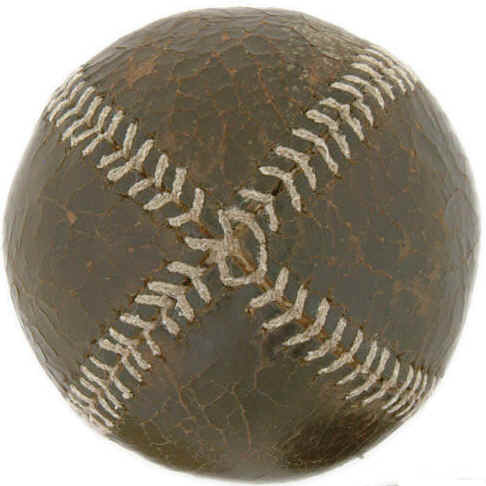 The baseball of the 1860s was slightly larger than modern balls, and the stitch pattern wasn’t the same either, with a single piece of leather wrapped around the typical string, yarn and rubber core in a “lemon peel” pattern; the modern “figure-eight” stitch pattern was created in the 1870s. 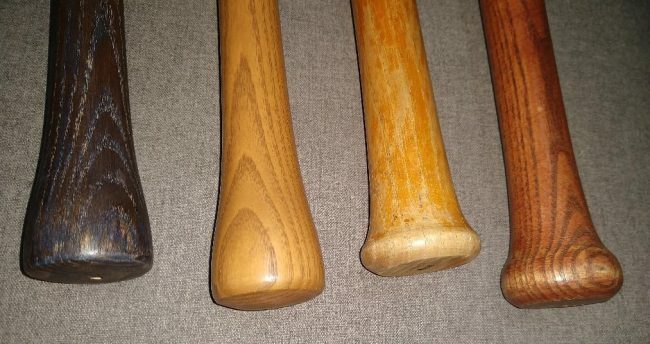 The bats have quite a variety of styles, all with thicker handles that the thin whips modern players use; they weigh up to several ounces more. Some have knobs, some just a flaring out at the end, while others employ a ball or mushroom cap shape at the end as a counterbalance. Bases are canvas or a similar material, often stuffed with straw or cloth to provide thickness. Home plate is generally a metal plate, typically round. Some teams like to add some local spice to their equipment. For example, the Batesville (Ind.) Lumbermen, many of whom work for the town’s casket factory, have four players act as pallbearers, carrying their bats to the field in a small coffin. Just as the rules and equipment of base ball have evolved, the language of the game has changed. The game itself used to be two words, similar to short stop. Ballists (players) would take their willows (bats) to the batting line (now a box) and become strikers (hitters). It once was thought that the hurler (pitcher) delivered the ball to the behind (catcher), but further research has revealed these last two old timey terms to be modern-day twists on the traditional position names. If a striker was not a victim of a hand lost, down, or dead (an out), having successfully made his first (singled), he then could attempt to advance around the bases and tally an ace (score a run). Teams often bring more than nine players for an event, and because players frequently travel a few hours or more to games, everyone wants to play. As a result, the entire roster will typically bat, and substitutions are very loose, with players frequently trading out of different positions on an inning-by-inning basis. While many players had nicknames 150 years ago, not everyone did. However, many vintage teams have created nicknames for their players to bring a little extra flair to the game for the spectators. Sobriquets can be inspired by home town, physical attributes, playing style, or perhaps a “memorable” incident the player may or may not be happy to recall. So, if you’re watching the 1869 Cincinnati Red Stockings (attired to match baseball’s first all-professional team) and Speedy fields a grounder and flips it to Punkin at second base, who then relays the ball to Juggles in an attempt at a twin killing, it all makes sense. Other anachronistic customs may include the ringing of a tally bell when a player crosses the plate, colorfully decorated bats, team buttons worn on hats, and other attempts to add some spice and capture fans’ attention. Many of these choices may seem harmless, but some players with a deep sense of the history and accurate portrayal of the game are put off by such displays. Generally, if teams aren’t trying to pass off these decisions as historically accurate—admitting the extra bit of flamboyance—it’s not too harshly frowned up. In a nod to the friendly, gentlemanly approach to the game, host teams often will provide a meal for their opponents after a contest concludes. It’s a chance to chat, enhance long-time friendships on and off the field, and get filled up before the long drive home. Teams typically start play in April and continue until October, paralleling the MLB regular season rather closely. Of course, weather is always a factor, and vintage fields don’t have the benefits of modern drainage, so games that are rained out often are not made up. This isn’t not a major issue (aside from the disappointment of not playing), since most teams are not part of leagues, instead contacting other teams each fall to schedule matches for the coming year. Doubleheaders are common, and three-team round-robin events are a popular way for each team to play two different squads in a single day. Larger festivals and tournaments have become terrific opportunities for several teams to come together. All-weekend events featuring 30-plus teams matching up on several fields exist in several locations, and competitive tournaments allowing teams to square off to determine a champion appeal to the most skilled teams. In a bit of irony, but a nod to the requirements of the modern day, Facebook pages abound for vintage teams, while some have their own web sites. 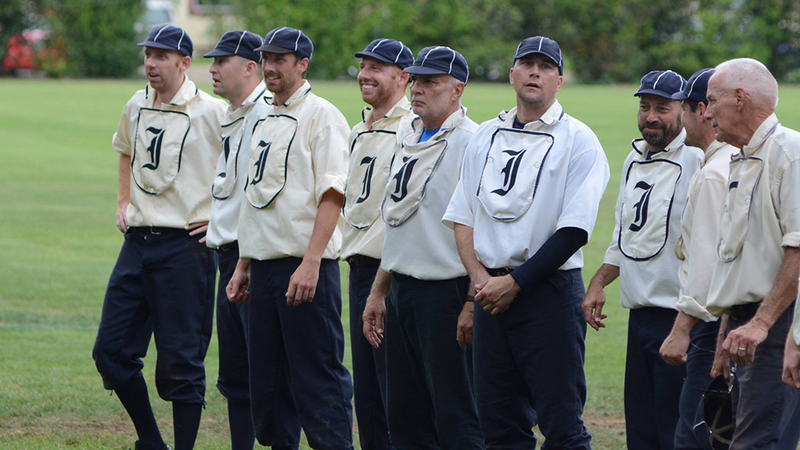 The Vintage Base Ball Association brings together member teams to provide education about the game, help new teams get started, encourage continued research to learn more about the game’s history, and of course, present the game to spectators at events around the country. These various web sites list schedules, game locations, prior results, photos, and other information. Vintage base ball is a nod to the history of the game, a way for participants to demonstrate how the game was played during its infancy. It’s a chance to forget about free agency and publicly funded stadiums, television rights and boisterous agents. It’s an opportunity to bring your chair to a field, sit in the sun, and watch history repeat itself right before your eyes. The style of vintage base ball described herein is based largely on game play throughout the Midwest. It is understood and acknowledged that other regions may have differences in their styles, similar to how the game itself grew and developed across the country in the second half of the 19th century. Comments regarding such differences are welcomed and encouraged! Watched a vintage game about 6 years ago on Governor’s Island in NYC. Was a blast to watch. They had their team flag or pennant that they were playing for. Cursing was strictly prohibited, and they were playing the one bounce and you’re out rule with no gloves. Senior players who couldn’t run were allowed a designated runner. The players were having fun and it was great to watch. I’m glad you were able to make it to a game previously, and I hope you get to more games in the future. There are a lot of teams in that area. If you happen to be in the Bay Area and found vintage ball interesting, you should check out the Bay Area Vintage Base Ball League! We’re league of ten teams from around the Bay that play ’86 ball. If you want to watch, or better yet try your hand at playing, we’re even hosting a pick up game on Dec. 9th at 11 at Golden Gate Park, SF! I’m aware of your league, and I’m jealous you can play pretty much year round. It’s going to stay below freezing here in the Midwest today. I grew up outside of Chicago, so believe me the joy of year-round baseball is not lost on me. Especially after getting snowed on while back for Thanksgiving. And we have recently formed the Southern California Vintage Base Ball league, 1886 rules. We have a scrimmage game this Saturday Crestline Highlanders vs Riverside Smudge Pots, and a full season starting next spring with 5 teams already assembled. Looking for more players and umpires too so look us up!